Memorial Day weekend was spent the way it should be — family, friends, cookouts, tennis, beach, reading, sun, sleep…it was perfect! If anything was lacking, it was sleep. Three days off work and only one 1-hour nap? I’m not sure whether to be impressed or saddened. The weekend was filled with too much other fun stuff to let a little fatigue get in my way. Sunday was a day of rest. And reading. We even went out for a leisurely meal at 9pm after we hoped all of the weekend out-of-towners were through crowding our local restaurants. No such luck. Summers in southwest Michigan are packed with vacation-ers Memorial Day through Labor Day. Monday included a bit of tennis, Lily’s first beach trip of the year, an interior cleaning of my car, and a dreaded trip to the grocery store. We held an impromptu get together with friends and their families totaling 9 hungry mouths yet again. Let’s just say leftovers and paper plates were involved…but at least the weather was perfect and a good time was had by all. While I’ll need today to recover from the weekend and as a reprieve from the kitchen, the rest of the week’s menu is simple. Quick meals. When the weather is nice, the grill and meals ready in minutes are the name of my game. As much as I love to cook, I’d prefer a tennis match or reading in warm weather. Time is (somewhat) wasted in the kitchen when there’s so few beautiful weeks in Michigan. And sometimes, I’m just lazy/pregnant…or just straight up HUNGRY and unwilling or unable to wait to eat. The evening I threw together these lettuce wraps, I had braced myself for the push back from Mr. P. I was expecting complaints of them being “too healthy” or “not substantial enough for a meal”. 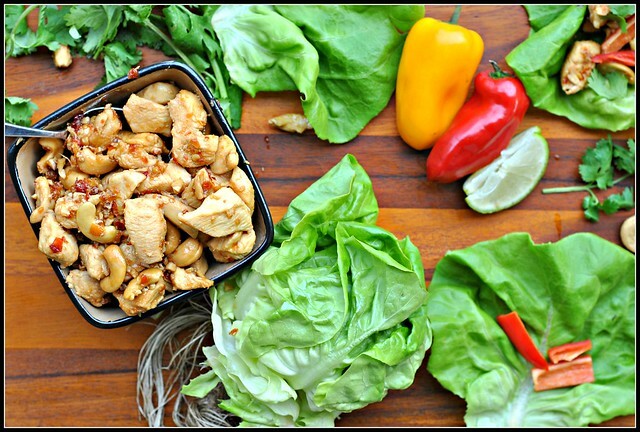 But instead, this turned into a meal for 2 — mostly for him….inhaling these Cashew Chicken Lettuce Wraps. My mom made lettuce wraps recently, as well…and hers don’t stack up against these (sorry, ma!!). GREAT flavor and they come together quickly. 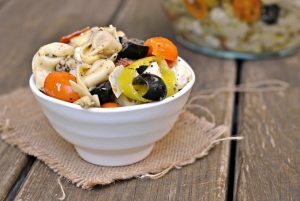 These are perfect as an appetizer or to chow down on for dinner. This is a favorite, for sure! Whisk together all sauce ingredients until smooth; set aside. Heat the oil in a large skillet or wok, over medium heat, until hot. Add the diced chicken and stir-fry until cooked through and no longer pink, about 8-10 minutes. Add the sauce and mix well; bring a simmer and allow to thicken, stirring often for 3-4 minutes. Stir in cashews. Remove from heat and allow to cool slightly. 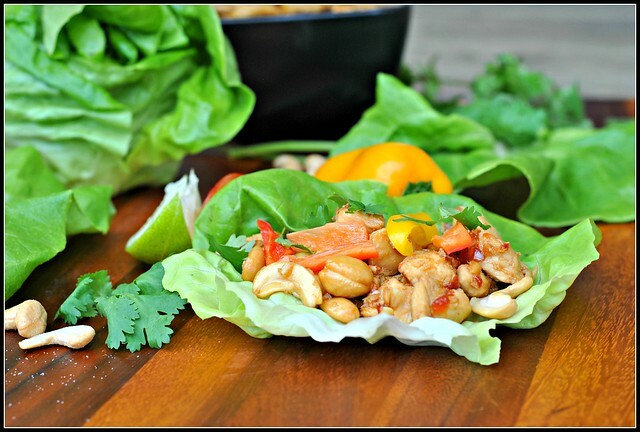 Assemble the wraps by scooping chicken into the lettuce leafs and top with bell pepper and cilantro. Serve immediately. Hoping this short work week is less busy than the last few have been! « We’re having a baby _____! When I saw Shea I immediately though “Sofia”, but love Olivia also…my favorite niece 🙂 What are you reading these days? I’m on the hunt for a news series til the next Robyn Carr book, The Promise comes out next week!! 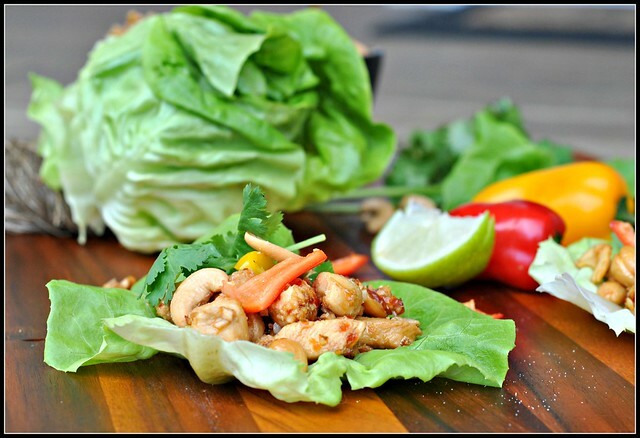 Yup, those lettuce wraps are on my menu…looking for lots of easy, quick recipes now that we are, and have been in the humid heat of summer here in South FL! Quick and easy is definitely the name of the food game for me this week also! Feeling so behind on life already! It sounds like you had the perfect long weekend! 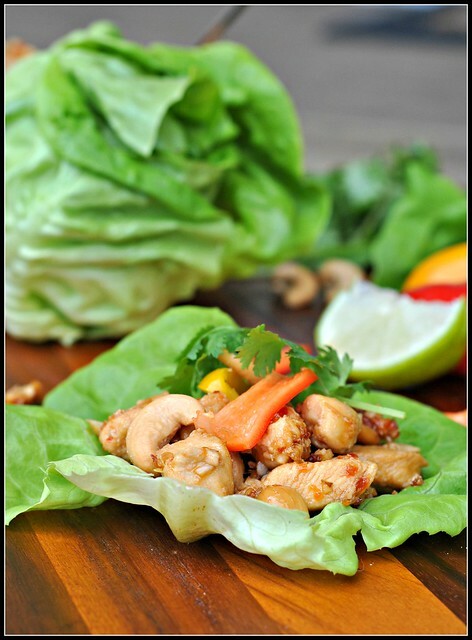 And these lettuce wraps…well, these are something that I could happily eat every day of the week. Hi Sara! I usually buy Kikkoman (sp?). Maybe I don’t know the different to know it’s not the best? Not sure, but they are bold flavors and give off lots of flavor to my palate! Hey Nicole! Just wanted to say hello to a fellow RD. I stumbled across your page in search of inspiration for dinner tonight – making a sausage and goat cheese pasta, something or other. Love your blog- I will be subscribing! This is one of my go-to, middle of the week meals! It’s so easy and delicious but I use Bragg Liquid Aminos instead of Soy Sauce just because I don’t eat soy. I also use coconut oil instead of olive or peanut oil because of it’s stability at high heat. 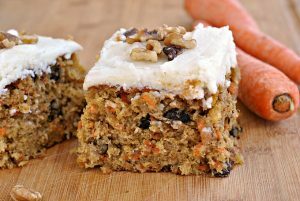 They are easy substitutions and you still get that amazing flavor!